As I’ve mentioned before, when I started reading comic books in the early 1980s I was mainly a Marvel fan. I read a few DC books like Warlord and Jonah Hex, but nothing that was closely connected to their superhero continuity. I didn’t really start paying attention to the DC Universe until after Crisis on Infinite Earths cleaned up DC’s hopelessly bogged down continuity and paved the way for creators like John Byrne, Frank Miller and George Perez to revamp the likes of Superman, Batman and Wonder Woman and make them more accessible to new readers. I became an instant convert and embraced the DC Universe with open arms. Byrne’s Superman and Perez’s Wonder Woman both did a great job of reintroducing the characters and streamlining their continuity into reasonable backstories that were textured without being overwhelming. Mike Grell’s take on Green Arrow was refreshingly naturalistic, using the character’s lack of supernatural powers to focus on urban drama rather than fantasy heroics. Even Keith Giffen, JM DeMatteis and Kevin Maguire’s Justice League took an inherently absurd idea, that of a team of superheroes, and managed to play it for laughs without it seeming out of place. I never really bothered going back to see if anything interesting had been done before Crisis. For the most part it didn’t seem like I had missed much, with one possible exception: it seemed like Marv Wolfman and George Perez had been doing some interesting things with the Teen Titans, but in an age before convenient trade paperback collections, it always seemed like a bit too much work to catch up. All of which brings us in a roundabout way to DC Universe Legacies, a series which attempts to cast a new eye on the DC Universe by observing the various eras of its history through the eyes of a retired Metropolis policeman who saw it all, but mainly as a bystander. DC tried something similar in 1986 with History of the DC Universe, but that was really a heavily illustrated prose book rather than a proper comic, and it lacked the accessible, human point of view provided by Legacies’ narrator. Each two- issue story examines a different era of DC’s history and uses a different artist whose style complements the issue’s time period. Scott Kolins provides a two page framing sequence in each issue, tying the stories to the modern day. Issues 1 and 2, covering the Golden Age, are illustrated by Andy and Joe Kubert. Issues 3 and 4, covering the Silver Age, is illustrated by Jose Luis Garcia Lopez, a mainstay illustrator for DC at that time, and inked by Watchmen artist Dave Gibbons. 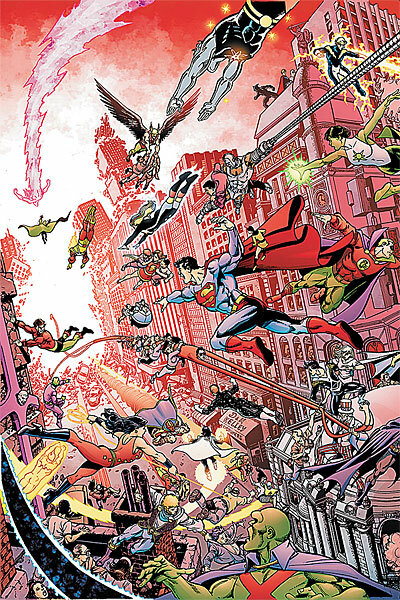 And this month in issue five the Crisis era begins, and who else but George Perez could illustrate it? …and maybe that’s the problem. I mean, Perez’s artwork is beautiful to look at, but…who ARE all those characters? I’m sure there are plenty of diehard fans who can name all the characters in any given crowd scene (I can usually name most of them), and it’s a treat to see all those obscure characters in the background when you know who they are. But at the same time, the pages sometimes seem to strain under the weight of all those characters inhabiting the same world, and that’s the very thing that, more often than not, prevents DC’s creators from telling accessible stories, and the thing that Crisis on Infinite Earths was supposed to alleviate. It’s not just that there are too many characters in the DC Universe, it’s that they won’t let us forget that there are too many characters. And maybe they try a little too hard to fit all those characters on the same page.